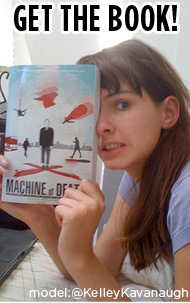 If you haven’t been listening to the Machine of Death podcasts, why not? They’re 100%, honest-to-George FREE, and read by wonderful actors or the authors themselves! 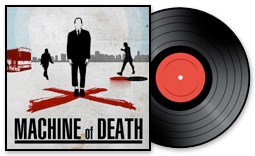 A new story from Machine of Death is added every couple of weeks, and for your convenience we’ve listed below all the ones we’ve released so far. by Erin McKean. Read by the author. by Kit Yona. Read by the author. by Yahtzee Croshaw. Read by the author. by John Chernega. Read by Kevin McShane. by David Michael Wharton. Read by Todd Luoto. by Shaenon K. Garrity. Read by Dave Kellett. by K. M. Lawrence. Read by Clair Lockeyear. by Tom Francis. Read by Christopher Joseph. by Alexander Danner. Read by Kris Straub. by Rafa Franco. Read by the author. by James L. Sutter. Read by Jonathan Shockley. by Brian Quinlan. Read by Jason Frederick. by Camille Alexa. Read by Colleen AF Venable. by Pelotard. Read by Lore Sjöberg. by Camron Miller. Read by Joanna Penn. by M. Bennardo. Read by Brian Swanson. by Jeff Stautz. Read by Joel Watson. by J Jack Unrau. Read by the author. by Ryan North. Read by MC Frontalot. by Jeffrey Wells. Read by Jesse Thorn. by Chris Cox. Read by Todd Croak-Falen. by William Grallo. Read by Bradley McLaughlin. by Bartholomew von Klick. Read by Christopher Osborn. by David Malki !. Read by the author. by Julia Wainwright. Read by Timothy Volpert. by Sherri Jacobsen. Read by Tiffany Peterson. by David Malki !. Read by Nika Harper. by Gord Sellar. Read by Brett Donnelly. by James Foreman. Read by Andrew Giordano. by Daliso Chaponda. Read by Iké Amadi. by Douglas J Lane. Read by Zach Weiner. by C.E. Guimont. Read by Sean Casey. by Randall Munroe. Read by Howard Tayler. by T.J. Radcliffe. Read by the author.